This weekend I would love to be right here. I wish I had a bathroom this gorgeous. I would literally live in it. Even if you don’t have such a decadent bath, you should definitely take time this weekend to spoil yourself. I know we’ve all been working so hard, and we deserve a little pampering. To get started on my pampered weekend, I am going to enjoy a gift sent to me from the wonderful Karen Young at Hammocks & High Tea. I wrote earlier this year about Hammocks’ beautiful line of organic pillows. 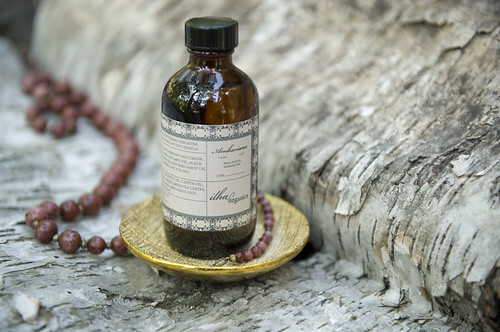 Now, Hammocks & High Tea has expanded their line of home goods and accessories to include a new line of organic balms and oils inspired by the Caribbean. Ilha Organics is a wonderful collection of hand blended oils and balms that are made to rejuvenate the mind and the body. 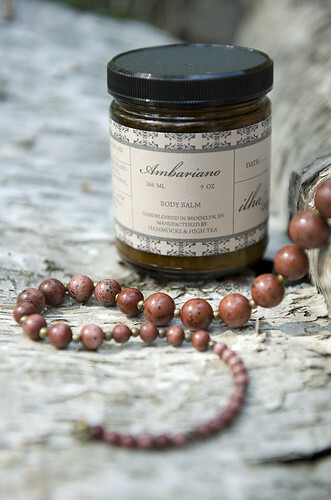 My favorite is Ambariano, which has a mix of vanilla oil, green tea leaves and amber resin. Yummy! Have a wonderfully relaxing weekend everyone, and remember, take a little time to pamper yourself. You deserve it! OMG, that is the most amazing bathroom. It looks so relaxing. That tub is to die for. I feel like I get claustrophobic if I'm in a room with too many things (I blame my mother for this) but I can definitely appreciate fine decor. I love romantic bathrooms, there's just something to sensual and calming about them. Though personally I couldn't do it, I'd love to just slide into that bathtub, filled will bubble bath! Welcome Janelle! So glad you found AphroChic via My Marrakesh. It's one of my favorite blogs. The Queen of Hearts, my mom was the same way. I don't know if I could live in a bathroom like this either. I might feel like I would break something, but it is beautiful to look at. It makes me think of the way I want to feel – beautiful and luxurious. The VANITY!! I have a thing about vanities. I love the whole bathroom decor, but THE VANITY!! !